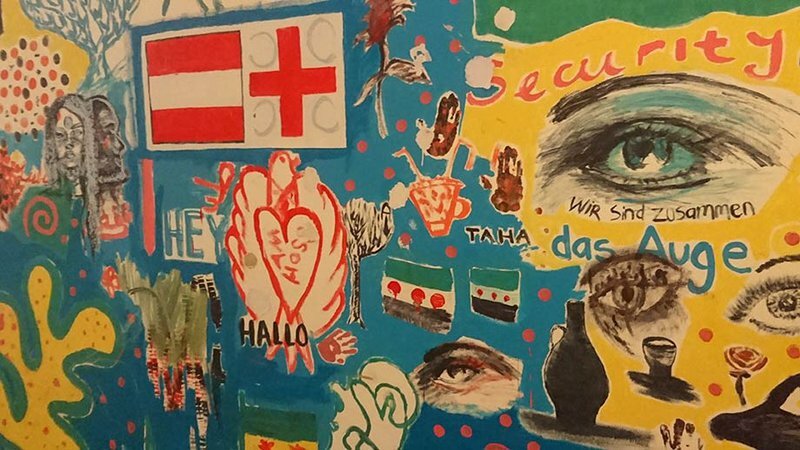 The refugees who once lived in this Austrian shelter left plenty of traces, their voices echoing off the walls through dozens of messages and murals depicting hope, strength, love, and language class. 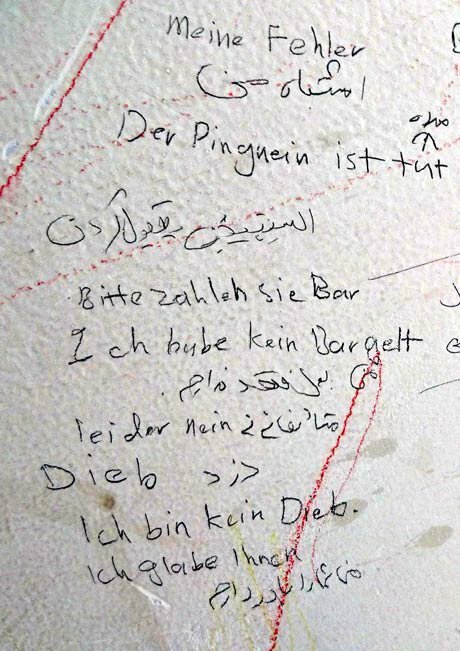 A mural on the wall in the Zollamtsstrasse refugee centre. Photo by author, all rights reserved. Inside the former financial court building on Zollamtsstrasse, the rooms now stand empty. The last remaining Red Cross workers clear away the children's toys, the chairs and tables of the schoolrooms, and the books of the library. 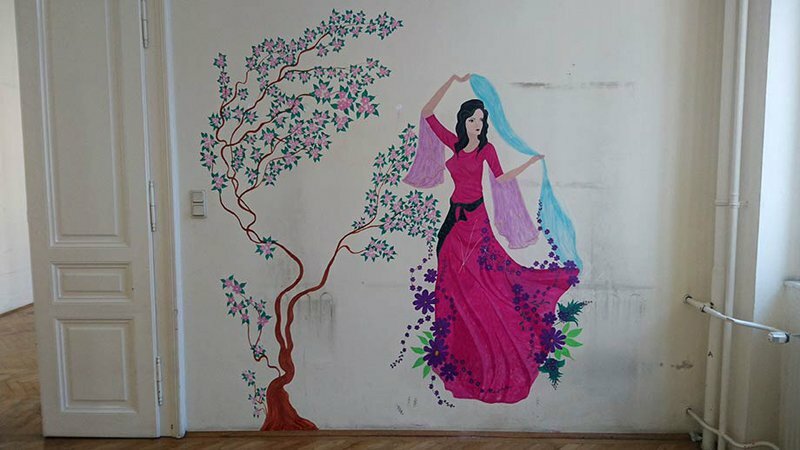 The refugees were recently moved after eight months here, and the building will become a university's fine arts department – apt, I think to myself, as I wander around, admiring the colourful murals daubed on the corridor walls by refugees and volunteers. A dancer painted by a Syrian woman in her family bedroom. Photo by author, all rights reserved. 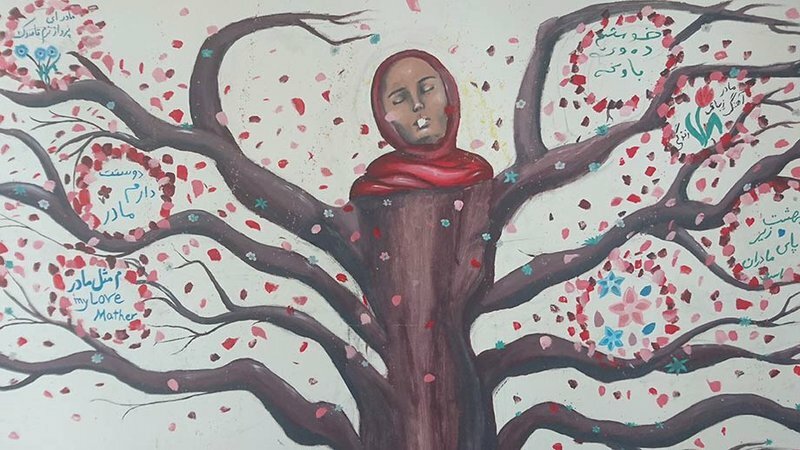 Downstairs, a vast painting shows a woman's head on the shoulders of a flowering tree, messages of love and motherhood in among its leaves, while a golden phoenix soars overhead. Another mural is coated with flags and symbols of all nations, with meaningful words memorialised: security, hallo, freedom. Upstairs, a Syrian family's room is decorated with a beautiful woman in a blossom orchard dancing with a silk scarf, her skirts billowing in the gentle, petal-strewn wind. Similar flowers bloom around the electrical power outlets in the wall. An Afghani has drawn with coloured pencils two children, falling in love, playing music: Ich komme aus Afghanistan, ich liebe Afghanistan – I come from Afghanistan, I love Afghanistan. Another has drawn the crest of Arsenal Football Club. 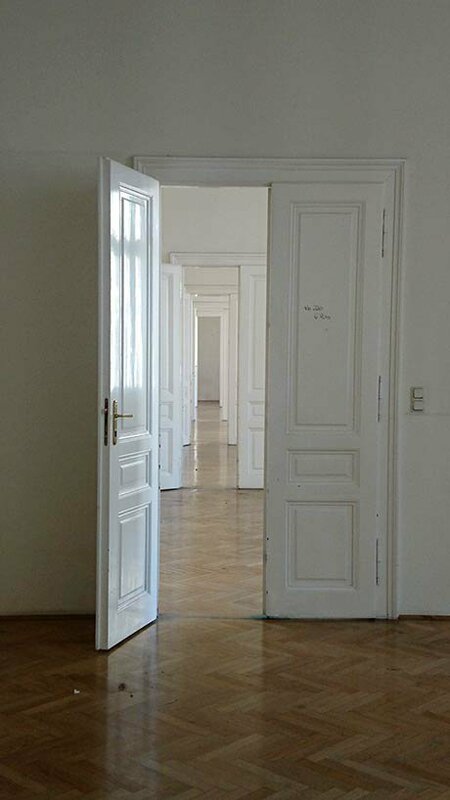 The rooms of Zollamtsstrasse refugee centre. Photo by author, all rights reserved. Around 1,200 people were lodged here, mostly young men, but also plenty of elderly people, women and children, including unaccompanied minors. The doors to the bedrooms still bear the nameplates of the former tax inspectors, as well as the administrative chalk marks of the refugee centre. Room 421, formerly the office of Helmut Hummel and Magistra Regine Linder, was converted to accommodation for six persons. Office buildings aren't designed as living spaces, though: no showers, insufficient toilets, no clothes washing facilities, only the top-floor canteen for cooking – and no one was allowed to use the lift. At first, people were taken in small groups by mini-bus to municipal baths and might have one shower per week. Zollamtsstrasse wasn't meant to be permanent, but the refugees liked being here because, unlike at other more institutional refugee centres, there was always something to do. German classes in one of the four schoolrooms and a kindergarten for the youngest children, regular clay modelling workshops and dance empowerment classes, games of table tennis, table football and chess, as well as other projects like designing and painting the murals. Students from the university also designed and delivered two metal container shower blocks. As one of the volunteers, Stephan, told me, the philosophy of the place was that anyone could just come and do anything. “There are no rules, no bureaucracy, just openness”, he says. “This is nice for students used to bureaucracy. They have the freedom to create”. But the heart of the building was the café, which ‘sold’ free cakes, cookies, tea and coffee, and hosted concerts, talks, films and art exhibitions. Every Saturday was women's day, when men were forbidden, the blinds were drawn and hijabs could be removed in privacy. Although not without its problems, particularly with regards to the protection of women, Zollamtsstrasse sounds like it was a brief interlude of freedom and real attempts at integration between refugees and residents in Vienna. My volunteer guide Patricia is obviously shaken that the hall where the café once lived is now dead. The serving bar torn out, the dishwasher ripped from the wall, the stage carted away. The only survivor is a chalkboard drawing of blooming flowers and a tree in blossom: the enduring emblem of Zollamtsstrasse. 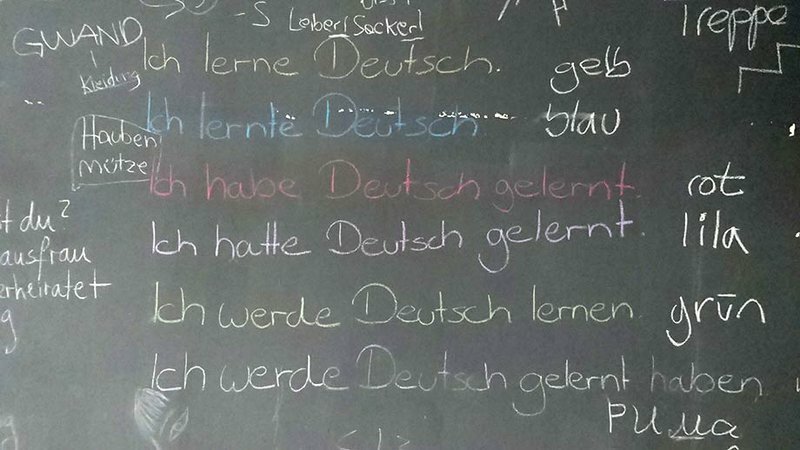 'I have learnt German!' on a chalkboard in a classroom. Photo by author, all rights reserved.